Asthma is one of the chronic ambulatory care sensitive conditions, meaning if timely primary care were available it could prevent the need for hospitalization. 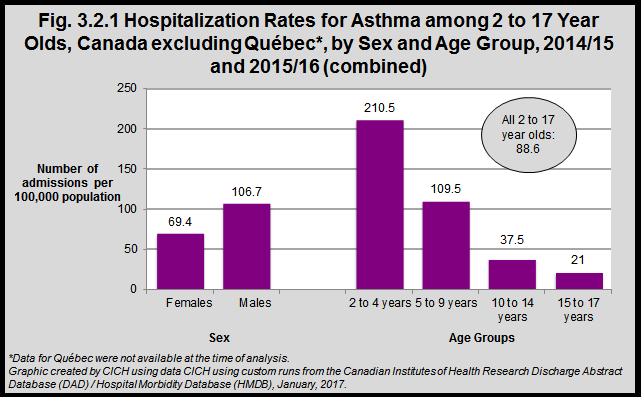 In the combined years 2014/15 and 2015/16 the rate of hospitalization for asthma for all 2 to 17 year olds was 88.6 hospitalizations for every 100,000 children in the population. The rate was higher for boys (106.7) than for girls (69.4). Young children under five were at most risk – the hospitalization rate due to asthma among children 2 to 4 years was almost twice that of 5 to 9 year olds and was almost six times the rate among children 10 to 14 years of age.